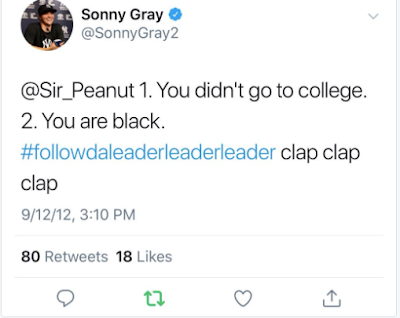 Minutes after leaving the mound laughing at Yankee fans booking him, Sonny Gray deleted a racist tweet. Gray called his tweet an "inside joke" between him and Rashun Dixon. Yet the tweet, all of @SonnyGray2's tweets actually, are gone. "I'm not scared of my past," Gray added after the Yankees' 7-5 loss to the Baltimore Orioles. "My past has helped shape who I am today, so if people want to try and question who I am, like I said, I'll face that head on because I'm not scared of my past. Everything that's happened in my past has done nothing but make me a better man. So that's irrelevant to me." A guy who laughs leaving the mound down 6-1 in the third, apparently.